Hi there! Today’s recipe is a delicious and simple gratin dish all made in one pan! I like to combine breadcrumbs with shredded cheese to create a thicker topping that’s extra crunchy and cheesy. If you want, check out my recipe for Zucchini Gratin with Gruyere and Panko Breadcrumbs! This dish combines two of my favourite vegetables: potatoes (I’m partial to baby potatoes aka creamer or new potatoes) and Brussels sprouts (I buy the small bright green ones as they are often less bitter than large ones). 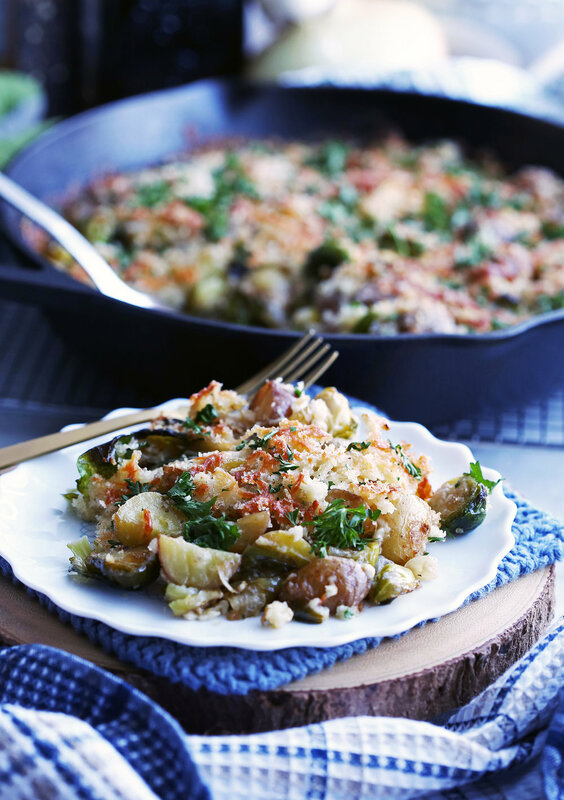 I hope you enjoy this recipe for One-Pan Brussels Sprouts and Potato Gratin! How to make this easy gratin recipe? Sauté onions and baby potatoes (aka new or creamer potatoes) in butter and olive oil. Full ingredient amounts and complete instructions listed in the recipe card below. Add in the Brussels sprouts and minced garlic. Toss to combine. Pour heavy cream over the vegetables and then top with shredded cheese and Panko breadcrumbs. Dot with butter pieces. Bake at 400 degrees F for 20-25 minutes until the vegetables are tender. Sprinkle with fresh parsley. Enjoy! Looking for more Brussels Sprouts recipes? Here are four more! Delicious: Savoury tasty flavours that work wonderfully together. Full of texture: Tender sautéed vegetables baked in cream with a cheesy crunchy topping is just so good! Quick and easy to make: Everything is made in one-pan! Fast clean-up too. Made with simple ingredients: These ingredients are mostly pantry staples or can easily be found in most grocery stores. Easy to substitute ingredients: I like the flavour of jalapeño Monterey Jack cheese for that little kick of heat, but it’s easy to substitute with other melty cheeses such as cheddar, gruyere, or mozzarella. You can also sub Panko breadcrumbs with seasoned (or not) Italian breadcrumbs if you want. Perfect as a fall or winter side dish: Take advantage of Brussels sprouts when they are in season! In a 12-inch cast iron skillet or a large high-sided ovenproof pan at medium-high heat, melt olive oil with one tablespoon of butter and then add the potatoes, onions, and salt and pepper. Sauté for 8-10 minutes, allowing the potatoes to slightly softened and lightly golden. Add in the Brussels sprouts and garlic, tossing together until the ingredients are well distributed, about 1-2 minutes. Remove the skillet from heat and pour the heavy cream evenly over the sautéed vegetables. In a small bowl, combine the shredded cheese, breadcrumbs, and salt and pepper together. Then sprinkle the mixture on top, making sure to distribute the topping evenly over the ingredients. Dot with the remaining tablespoon of butter. Bake for 20-25 minutes, until the potatoes and Brussels sprouts are tender, and the topping is golden brown. Top with fresh parsley. Best served immediately.